Some of the UK's largest charities are focused on health and medical research. Many of the UK's top medical charities are engaged in leading research to find new treatments and cures for a range of diseases, particularly cancer. 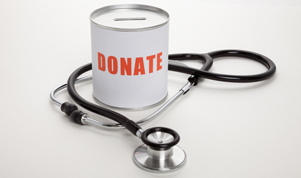 Medical charities also enhance awareness of different conditions and provide a variety of supports to individuals with health problems, as well as support for their families and caregivers. Founded as The Diabetic Association in 1934, Diabetes UK carries out campaigns to improve the care and treatment of individuals living with diabetes. The charity has over 180,000 members and more than 300,000 supporting members. It adopted its current name in 2000, having also been known as The British Diabetic Association from 1939. Diabetes UK is based in London and operates offices throughout England. National offices are also found in Scotland, Wales and Northern Ireland. The charity is also supported by a network of local support groups. Diabetes UK provides a range of services. Since the 1930s, it has run care holidays for children with diabetes. The charity also offers holidays for families and adults affected by diabetes. The holidays are ways Diabetes UK provides support and advice. Diabetes UK also offers a 24-hour counselling line for family and friends. Since 1936, the charity has funded research activities in the UK. Funding is focused on research related to the causes and treatment of diabetes and related conditions. Other activities include charity runs for diabetics and their families, dedicated events for families and their diabetic children, and children and youth focused events. Diabetes UK also offers specialised training courses. In addition to purchasing memberships, individuals may support the work of Diabetes UK by getting involved with a local support group or event. To learn about upcoming events or to donate and volunteer with Diabetes UK, visit www.diabetes.org.uk. The Royal National Institute of Blind People (RNIB) provides support and advice to nearly two million people across the UK. Founded by Dr. Thomas Rhodes Armitage in 1868, the RNIB was originally known as the British and Foreign Society for Improving Embossed Literature for the Blind. In 1953, the charity adopted a version of its current name and operated as the Royal National Institute for the Blind. The current name came into use in 2007. Based in London and supported by branches across the UK, RNIB's patron is Queen Elizabeth II. The membership-based organisation is also supported by more than 3,000 volunteers. Alzheimer's Society is focused on individuals with dementia and their caregivers. The charity operates in England, Wales and Northern Ireland, and is affiliated with Alzheimer Scotland and The Alzheimer Society of Ireland. In addition to Alzheimer's, the charity is also dedicated to supporting care and research for Korsakoff's syndrome, Creutzfeldt-Jakob disease, Lewy bodies, HIV-related cognitive impartment and various other forms of dementia. Founded in 1979, the charity is supported by approximately 25,000 members and 230 branches across England, Wales and Northern Ireland. The Alzheimer's Society engages in a range of activities, including supporting research related to the cause, cure and care of dementia and related conditions. The charity also organises campaigns related to the rights of people living with dementia, as well as their caregivers. It also engages in lobbying activities and provides training programmes. The Alzheimer's Society also provides support for people with dementia and their caregivers online or by telephone. For information about supporting the work of the Alzheimer's Society, visit www.alzheimers.org.uk. Cancer Research UK was formed in 2002 following the merger of The Cancer Research Campaign (CRC) and the Imperial Cancer Research Fund (ICRF). While the ICRF traced its roots to 1902, the CRC was initially formed as the British Empire Cancer Campaign in 1923. The charity works to reduce the number of cancer deaths by supporting research activities and raising awareness. Cancer Research UK supports the work of researchers, doctors and nurses. It also supports more than 200 clinical trials and studies, as well as research into over 100 types of cancer. Much of the charity's focus is on funding new treatments, prevention, early detection, surgery and radiotherapy. Among the world's largest cancer research charities, Cancer Research UK's work is facilitated by grant-funded researchers and nearly 4,000 employees. The charity also boasts over 40,000 regular volunteers. It also provides a number of tools for the public, including a clinical trials database (CancerHelp UK) and a confidential telephone service (Cancer Chat). Cancer Research UK also publishes the British Journal of Cancer and acts as an advocate for improved cancer services. Cancer Research UK raises funds from donations, legacies, corporate partnerships, and various fundraising activities including charity runs and walks. Having raised more than £493 million since 1994, the Race for Life is the UK's largest women-only fundraising event and raises money for 200 types of cancer. For information about donating, events or volunteering, visit www.cancerresearchuk.org. Founded in 1948, Marie Curie Cancer Care provides free nursing care for terminal ill people living at home or in hospices. Supporting tens of thousands of peoples each year, nurses provide practical and emotional support for cancer patients, families and caregivers. The charity also operates nine Marie Curie Hospices and is the largest hospice operator outside of the National Health Service (NHS). Hospices are located in London, Liverpool, Edinburgh, Glasgow, Newcastle, Bradford, Belfast, Penarth and Solihull. Marie Curie Cancer Care also supports cancer research, particularly research on care for terminally ill cancer patients. The charity funds three long-term palliative care research facilities in London, Liverpool and Cardiff. It also provides research grants and hosts an annual research conference with the Royal Society of Medicine and encourages research in its hospices and nursing service. The charity organises a wide range of fundraising events, including charity walks and runs, cycling events, hiking and mountain challenges, swimming events, the Blooming Great Tea Party, and the Daffodil Day appeal. To learn more about donating or volunteering, visit www.mariecurie.org.uk. Great Ormond Street Hospital is an internationally renowned children's hospital in Bloomsburgy, London. Founded as the Hospital for Sick Children in 1852, the hospital was England's first to offer in-patient beds dedicated for children. The Great Ormond Street Hospital Children's Charity is one of the hospital's major sources of support. Charitable donations and activities help keep the hospital at the forefront of healthcare, including directly supporting for research. Funds are also used to purchase new equipment and help families and hospital staff with accommodation. The Great Ormond Street Hospital Children's Charity aims to raise over £50 million each year. Past campaigns have included charity singles in partnership with ITV's The X Factor and Channel 4's Comedy Gala, which is held annually since 2010. The charity also sponsors charity runs, cycling challenges, skydive and triathlon events, trekking challenges and other events. In addition to donations, the charity is funded through corporate giving and legacies. For more information about supporting the Great Ormond Street Hospital Children's Charity, visit www.gosh.org.